Pull Over Nancy… We’re Getting A Little Bit Too Negative For My Tastes. What is happening my lovely friends? Aren’t you excited for the weekend?! I sure am. I hope you stay safe and have lots of fun! There, you see what I did there? That’s what I would like to think is a positive well-wishing for everyone out there. The key word of course, in case you could not figure it out, is positive! That’s right, I think it’s necessary to recognize the fact that there is often times too much negativity in our lives and we need to constantly reinforce the positives! Why should you care? 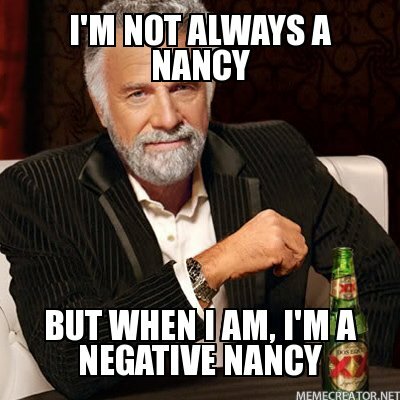 Well it’s simple: nobody likes a Negative-Nancy. That’s right, people hate it! So before we even get under-way with this fancy little topic, you might as well hand me over the keys. The keys to what? Well, the keys to the Bitter-Bus that you are always driving (if you are a negative person, that is). But what is it about this whole positive/negative balance that seems to have people obsessed? Well, as one of the many on the obsessed side of things, I’m a firm believer that being positive is just so much better than being negative or bitter or angry or temperamental, etc etc etc. You see my point, though? People just don’t like it. One negative person in a room full of cheery individuals can brings down the atmosphere so harshly that people will actually go out of their way to avoid conversation with you! I know because I’ve done it! And yes, I realize that we all want to vent and complain but there is a right time and a place to do so! NO! Don’t do that! That’s bad! Bad! And don’t be a Whiny-Willard either! We all unfortunately know one: “My shoes are too tight. The sky is too blue. That bird looks stupid. Oh, you’re gonna wear that? I could have found a better place”, etc etc etc! Once again, people will want to avoid any and all social interactions with you! But are you still sitting there going: “Yeah, well, why should I be so darn positive when everyone else is so negative around me”? Well here’s the skinny of it: Karma! Now I know that everyone does not believe in this lovely little term; even I only believe in it to a certain extent! But let’s not dismiss it entirely just yet. What is Karma? Well, it’s a certain social law that simply states: what goes around comes around… you do something douchy to someone else, chances are, something negative will happen to you in turn. The same applies if you are constantly positive; positive things will constantly keep happening to you. Now think about this… karma is exactly how we choose to perceive it. It’s just a term; a notion, a philosophy, it’s whatever! Therefore, if you choose to believe that it will do wonderful things for you in the future then believe that and I can guarantee that it will! Life is exactly what you make it out to be and if you are able to put a positive-spin on every negative thing that happens in your life, then I can give you a 100% guarantee that you will enjoy the outcomes. You will be more loved and enjoyed; as well, you’ll have more friends and instead of raining down crap on you everyday, life will eventually throw in a few gum-drop and puppy-storms along the way. This entry was posted in Lovin' Life!, Rants and tagged Culture, Debbie Downer, Friends, Funny, Karma, Misc, Miscellaneous, Negative, Negativity, Philosophy, Positive, Positivity, Random, Rant, Saturday Night Live, Writing. Bookmark the permalink.